I first heard of the fist-fight between Ernest Hemingway and Wallace Stevens in KWLS co-founder Lynn Kaufelt’s book, Key West Writers and Their Houses. It didn’t ring quite true, somehow, and yet the story’s skeleton alone begged frequent repetition. Hemingway, man of action and hard drinking, fan of violence in so many forms, and Stevens, cerebral, executive, ironic: each gave as much to American writing in the 1930s as any. That they both spent considerable time that decade in tiny Key West was improbable enough. That they actually came to blows over their no-doubt-innumerable differences was gravy, perhaps a fiction but, with apologies to Wallace, a supremely pleasurable one. Hemingway implies elsewhere a familiarity with Stevens’s poetry, and in a way his characterization of Stevens is not as unkind as it may seem. After all, Stevens was in his late fifties when the fight took place, Hemingway his thirties. Would Stevens, the author of such poems as “Poetry is a Destructive Force,” “Men Made out of Words,” and “The Good Man Has No Shape,” have objected to a characterization of himself as a “mirror fighter” practicing “lethal punches in the bathroom?” I think he’d rather chuckle at the shape of this image, see in it a metaphor for his work, and collect enjoyment life-long from this most unlikely of modernist battles. Hemingway’s story is from a letter to Sara Murphy, printed in Ernest Hemingway: Selected Letters 1917-1961, ed. Carlos Baker. ← The past is never dead. It’s not even past. That first hand account of the fisticuff on Wadell St. is not to be missed. That has to be the Daddy of literary connections! The whole site is spectacular in its breadth and depth. I think it is a treasure trove for anyone who cares about American literature and poetry (not to mention the Key West connections), and puts the Seminar squarely on the literary map. I wish I had time to read it all(and some of the books too!). time. yes that’s the challenge. That is a great story, and it seems, what’s missing from modern lit. What do we have now? Dave Eggers throwing eggs at cars, hiding like a little child behind a hedge? Then you had Kerouac, on TV with William F. Buckley, basically punching himself in the face with all that liquor and to quote Podhertz “typing.” Papa would’ve knocked them out. Gelhorn could take Eggers for God’s sake. Excellent! Great story and what a letter writer! I can just picture Mr. Stevens flexing his muscles in front of the mirror. Thanks for tracking me down and passing this story on! Seems you’ve gotten a head start on your ’13 “Writers on Writers” seminar, albeit if you go with a literal take. Surely there must be a couple more dueling men of letters who’ve come to fisticuffs over the years. At least this gives you some time to dig ’em up. 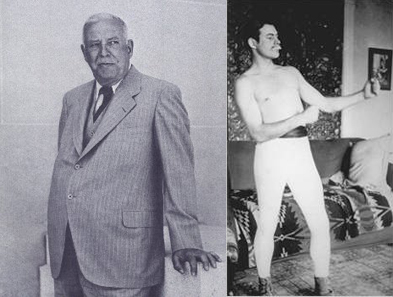 But–what really was the reason(s) for these repeated Wallace vs. Hemingway spats? Cockfight bets? A woman? Fish tales? Writers will strike for the jaw of another writer only when they feel said same is writing too much like they themself do or better and when the other writer’s work is so different from their own they have no myoptics through which to judge and they are frustrated in their unknowing. I personally have witnessed other artists do the same in similar situation. Musicians tend to drift off. Two languages met in combative air. which hover behind cantankerous blows. by elite curses quieted by sunset. like muscular sentences, taut and hard. from depths which collide: stanza and phrase. So the fight buoyed the machine of thought. yet stand anyway – an odd gigantism. and for a large red man who likes to read. icons at podiums of each other’s eyes. After reading the IDEA OF ORDER AT KEY WEST I can almost understand why Hemingway would be put off at a character like Stevens, a different kind of literary man, and attempt to beat at him. It is a long, frustrating distance between reality and perception, and while both men attempted to cross that chasm, they both succeeded at doing so. I am a fan of both writers, for different reasons and different approaches, but there seems to be a separate but unequal feel to all that, epecially in modern letters, and I guess it all started with that knock about. Hemingway was 20 years younger. So, a 37 year old man beat up a 57 year old man. Hemingway was always a bully. How quickly the body takes over. SK rightly notes the distance between reality and perception, but a straight right has a way of closing gaps very quickly. “Everyone has a plan until he gets hit,” I think M. Tyson said that, the punching epistemologist.